Those who use people power to shake the system in Turkey, as during the 2013 Gezi Park protests, are typically beaten and detained, not elected prime minister. Everything and everyone in Turkey has come up roses after Greece's new, maverick leader, Alexis Tsipras, won what looks like a landmark election victory. Pro-government pundits are happy because a "reformer like Turkey's leaders" has come to power. One newspaper claimed that Mr. Tsipras had confided to Prime Minister Ahmet Davutoğlu about how his party watched the ruling Justice and Development Party (AKP) with envy for 13 years. Another news story said Mr. Tsipras' victory meant the collapse of Turkey's main opposition. Secular and leftist Turks are also happy. "Greece's Che [Guevara]" is now in power. If, like in Mr. Tsipras' election slogan, "hope came to Greece," it too could come to Turkey. If Turkey's inherently unsuccessful social democrats could take lessons from Mr. Tsipras' rise to power, one day the real -not diluted- Left, like in Mr. Tsipras' coalition, could rise to power in Turkey too. After all, Turks and Greeks are not just Aegean neighbors, but are almost identical nations! So, the Turkish left and social democrats should imitate how bravely Mr. Tsipras defended his ideas and challenged the imperialist West, thus rising to power. This is, at best, an amusing narrative for a number of reasons. Turks and Greeks may have similar lifestyles on both shores of the most beautiful sea in the world, but socio-politically, the average Turk and Greek are worlds apart. In Greece, for instance, the communist party, KKE (Κομμουνιστικό Κόμμα Ελλάδας), won 5.5 percent of the national vote in the elections on Jan. 25. In Turkey, the communist party, TKP (Türkiye Komünist Partisi), won 0.15 percent of the vote in parliamentary elections in 2011. Mr. Tsipras has built his brilliant political career by fiercely sporting radical leftist/communist rhetoric. He has never hidden that he is an atheist, or that he has an extramarital partner and children (one of which is named Ernesto — after Che). He has openly challenged the Greek Church. In his student years he led a protest movement that looked like the 2013 Gezi Park protests in Turkey. A Turkish Tsipras would probably be in jail for organizing protests and defending atheism. 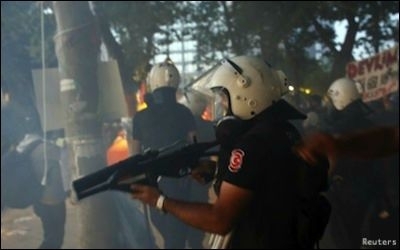 A Turkish Tsipras would probably be in jail for his role in the Gezi protests, if not recovering from injuries or killed by a gas canister or bullet. For the average Turk, he would be a "terrorist." If he survived all that and enrolled in university and shared an apartment with his girlfriend, who would later become the mother of his children, he could be prosecuted for disturbing his neighbors, who would complain that the couple was shamelessly violating the moral norms of the neighborhood. Having survived all that and then managing to unite the Turkish left under the roof of a party that calls itself radical, the Turkish Tsipras would this time face multiple indictments and stand court for each of his speeches in which he defends atheism. The charge? The curious reader should read the ruling about the pianist Fazıl Say, which sentenced him to 10 months in prison. If he miraculously escaped a prison sentence, he would face death threats from a big army of conservative/nationalist trolls who would wish to see him dead like journalist Hrant Dink. Still surviving and rising in politics? Dear Turkish Tsipras, you are really forcing your limits! In that case, the most likely outcome is that some prosecutor would indict the Turkish Tsipras for being the leader of a terrorist organization with aims to topple the government, asking for a life sentence. He would be arrested and tried under detention, possibly for a few years, without a ruling. Evidence? The speeches he had made, articles he had written and some shady documents found in his computer. Too dark? Maybe. Suppose none of that happened and the Turkish Tsipras went to the polls. That infidel, terrorist and communist who dares to denigrate Islam and has kids out of wedlock would win 0.98 percent of the vote. Why 0.98 percent? That is in proportion with his vote in Greece (36 percent) based on the proportion of votes communist parties in each country wins. Mr. Tsipras is a success story in Greece, like the AKP is in Turkey. What sells in Turkish politics is religion; and in Greece, radical left rhetoric.